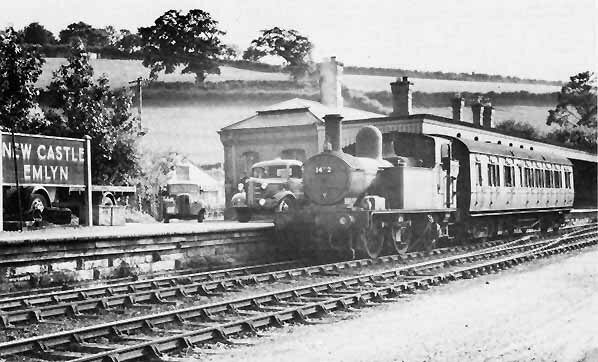 Newcastle Emlyn Station with GWR 14XX 0-4-2T No. 1472 and coach simmering at the platform ready for departure Circa 1950 (Post Nationalisation). The station is the end of the line from Carmarthen, branching off from the West Wales line at Pencader and passing through Llandysul and Henllan following the River Teifi a lot of the way. The Branch was opened in July 1895 and the station remained open for goods traffic long after the passenger service was withdrawn in 1952. The original layout plan looked like this and is substantially still the same at this point in time with a few tweaks here and there. and another of what was once Riverbank siding and is now the replacement Llandyfriog Junction including Signal Box lever frame and panel. Thought I'd better make a spot for my layout too, so here it is. I suppose that it is really the 3rd layout I've ever built but the first in 16 years and the previous two never made it past the track laying stage. One, the HO Christmas present, on a sheet of chipboard when I was about 16 and the second N gauge on a door propped up in the shed that the rats got into during a period of inactivity, sigh. This time I'm determined to make a go of it. 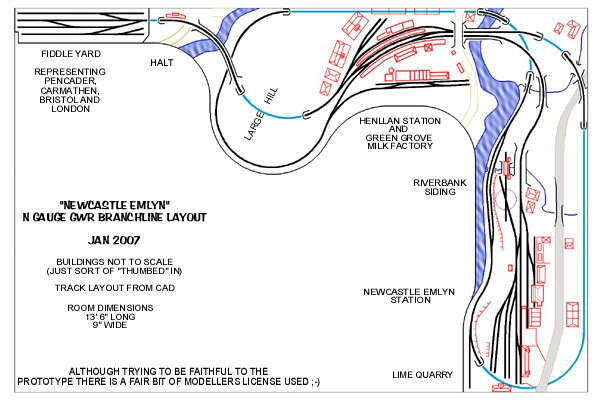 Newcastle Emlyn is an N gauge GWR branch line layout representing part of the West Wales branch from Pencader to Newcastle Emlyn from about 1934 to nationalisation. I guess that semi-prototypical would be a fair way of describing the plan. Both Newcastle Emlyn and Henllan stations are laid out as close as I can get to the prototype in the space I have available. The rest of the layout between the stations and the fiddleyard is freelanced but I hope to convey the feel of the branch when it's done. The "plan" has been developed over 12 months in Microstation CAD (I'm a cartographer by training), space made available after negotiations with T for use of one of the bedrooms for a permanent layout. I've had to leave the loft bed and robe in the room in case my oldest lad ( 18 ) comes back to visit but that's given me a run along two walls of 13' 5" and 9' 0" respectively. The plan says a total of 69' of single line running will eventually be required. Thus one of the benefits of N gauge and that doesn't count the yards and milk factory siding. I prepared the room before I started, repainting the walls sky blue, fixed and repainted the skirting boards and removed all the old paint and plaster from the polished floor boards. I should have done the ceiling too but being a federation style Australian house they are 14' high and I reckon by the time I get the layout lights in no-one will see the peeling paint anyway. The base is L - Girder open framework in pine, built in four sections so that should a house move be necessary, god forbid, I should be able to dismantle it and relocate. Each section is designed to fit through the door and be small enough to manoeuvre around the corner in the corridor, just... we're talking 10mm either side here. Somewhere in the back of my mind is the hope that I can take it to an exhibition one day. It's taken me 12 months to complete the framework, the last section join completed before Christmas. As well as working for a living, T and I run a small shop in a shopping centre and we are both State Emergency Service Volunteers (Civil Defence). Talk about busy!! The backboard was constructed in a frenzy of activity over the Christmas break and I'm really pleased with the result. I used 3.2mm masonite in the hope that I could bend it in the corners to avoid the right angle scene change which always looked a bit odd to me. It worked a treat. Masonite will snap if bent to far but the tightest backboard curve has a radius of about 420mm and looks great. I hope to get some digital photos of the area around the branch, tweak them in photoshop, get them professionally printed on a stable base plastic film and then paste them onto the backboard. This too might take 12 months!!! Finally, I'm ready to start setting up the risers from the L-Grider framework to support the plywood subroadbed for the track. The Henllan Station area will be first as if I can't get that to work the whole thing will need a rethink! Henllan had to be on a curve didn't it! Unless I take my time and have a good think about each bit I'm doing I make mistakes. A couple of times while cutting slots in the backboard to fit around the baseboard frame I took off too much. Sigh. A bit of glue with some scrap masonite and then some wood putty soon put it right but I get a bit frustrated with myself for making basic mistakes. Measure twice, cut once my old man always used to say. Good advice. I've purchased a Metcalfe Card kit of a factory, boiler house and chimney in N gauge and a plastic Kestral kit of a factory, both of which I plan to use in the Green Grove Milk Factory which I have borrowed from the Aberayon branch. They've both gone into the kits box for later construction. 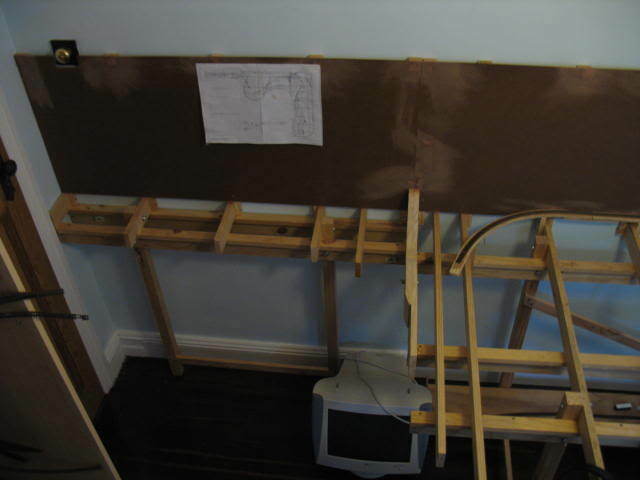 To progress the next stage of the baseboard I've got to buy/beg/borrow some more G clamps and a sheet of 10mm plywood before I can start on the subroadbed. T wants me to fix the two leaking taps and the dodgy back door lock on Saturday. Maybe she'll let me off further house maintenance to do some more on the layout this weekend once I've done that. Here's hoping. It took a while to work up the courage to name the layout after an actual GWR station and branch line and all that implies. But it did have that GWR feel about it that won out in the end and I intend to get the station as prototypical as I can. I've certainly given myself a challenge with the changes in elevation, saw some photos in a railway magazine years ago where the trains were dwarfed by the surrounding hills (not hard in N gauge I hear you say) and always wanted to convey the feeling that the trains are just part of the landscape on this layout. I haven't regretted it yet as I'm having great fun building it and look forward to the scenery construction. All of the stations, goods yards and the fiddle yard will be on single, flat pieces of plywood. So in reality, not far off your flat baseboard GWR, I've just joined them all together with inclines to give the effect of running from Pencader (the fiddle yard) downhill towards, but some miles from, Cardigan Bay. The open framework allows me, of course, to build the landscape down to the rivers as well as up to the surrounding hills. In reply to an excellent suggestion from Bob regarding the use of a workbench rather than the layout for detail work. I had planned on screwing the boards down permanently but there is a lot of merit in being able to take them to a comfortable workbench to work on. Like it, like it. I'll go back to the plan and see what I can work out, something like a cassette arrangement that slots into the vacant space and can then be locked down with case locks would work.... the track would have to be gapped in a similiar manner as that in a board join but that shouldn't be a biggie. First track was installed on Sunday, the bubbly was popped and T did join in the festivities. The only thing that is going to make the dioramas a little difficult is going to be the size of each of them. The Station layouts are pretty big, even in N gauge. Getting them off the layout and onto the workbench is probably going to be a two person job. Oh, and you know those mistakes I was talking about? 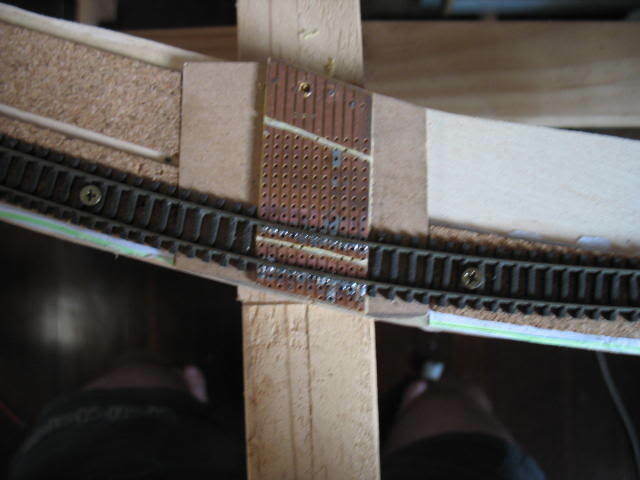 I was so keen to get the track down I forgot to gap the plywood roadbed, cork and rail at the base board join. Not a total loss, I think I've worked out how to get it gapped but it is going to mean taking the track up again, cutting a chunk out of the contoured baseboard joins so I can access the spot, cutting the cork with a knife and then using the Dremel to drill through the roadbed enough times until it comes apart. Sigh, and I was doing so well too. Thank goodness it was only 2 sections of flexi-track. The close-up Photo at the bottom shows the spot I'm talking about near the backboard, the little tunnel section through the baseboard joins. Practiced soldering tonight after you gents pointed me in the right direction in the Electrical - DC section. 2 nice clean solid joints that don't move, do conduct and sit tight up against the rail web. I'll practice some more before I start working with the nice new track. I'm going to have to requisition the bench space under the loft bed in the layout room and rig up some lighting. Soldering under the single room light was pretty difficult and I've also got tools and trains all over the place at the moment and will break something soon. Time for a tidy up. I guess that is part of the whole process! To console myself for stuffing up the road bed I've ordered 3 more wagons from Hattons. Dapol are doing private owner coal wagons with load in twin packs with different running numbers, I've been wanting a set for a while. Also another Peco GWR vent van to add to the collection. Ah well , when you've got to go shopping, you've got to go shopping. The online method is a bit dangerous actually, it's right there and I can do it NOW, and it saves on shoe leather. Still waiting for the wagons to arrive BTW. I've got a couple of the GWR siphons that Dapol have put out, nice models and so useful for adding operational interest to the layout. Pop one in behind the loco of the branch passenger train and there could be a load of milk churns for the milk factory or some rabbits or fresh fruit and veg for market. Soldering practice continues. I've now progressed from big chunky blobs of solder holding a bend in the wire dropper on the outside of the rail to a small dab of solder holding the end of the dropper wire as it comes up vertically through the hole in the baseboard (still to the outside of the rail)... and they are all nice and strong and conduct. Still practicing at the moment until I can consistently get the small dab rather than the big blob. The layout room has been tidied and the table moved under the loft bed to serve as workbench. A fluoro will have to be hung under the bed because it's pretty dark. 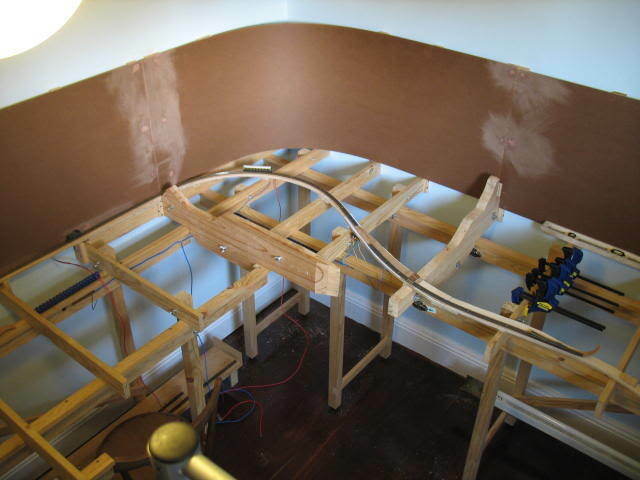 The track has come up again and the next stage is to have a go at separating the subroadbed over the baseboard joins. Sigh. Maybe this weekend. The cork and ply subroadbed over the baseboard join has been cut to allow the baseboards to pull apart if I ever need to. 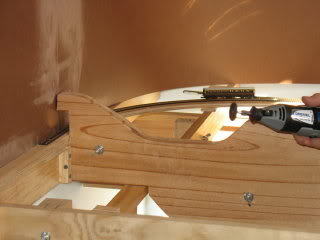 A Dremel motor tool with a 3mm drill bit held steady against a block of wood did the trick without too much fuss. Noisy though. It's not neat by any means but as it is at the back of the baseboard and in a tunnel I don't really care. Track has been laid again, wired up and tested. 3 bits of flexitrack now, whoo hoo, smooth running and power to each section of track. As previously discussed I've soldered the end of the rails at the baseboard join to a copper sleeper, scribed a gap in the copper to prevent short circuits and then screwed the copper sleeper to the subroadbed. This allowed for minor height adjustments to get the two sections to match up perfectly. Rather pleased with the result as it's the first time I've done it. The loco moves from one section of track to the other without the slightest problem, either electrical or mechanical. Power is fed to the each section of track via a direct feed from the power pack and a common return wire running around the baseboard on the L-girders to minimise wiring. The direct feed will go via a control panel and rotary switches eventually but for testing are just coming straight from the one power pack. For the common return, the solid copper wire droppers from the rail are soldered to flexible wire which runs under the baseboard to the L-Girder and is then soldered to a piece of copper circuit board screwed to the vertical face of the nearest L-Girder. The heavy common return wire is soldered to the copper circuit board and then fed around the frame to the return output of the powerpack. The copper circuit boards are strategically placed near track concentrations to allow multiple return feeds to be soldered to it and thus the common return wire. Plastic A4 binding combs are being used, screwed to the L-Girder and underframe, to keep all the wiring tidy. I'm itching to get on but we have visitors this week and one of them is using the loft bed in the layout room for sleeping. Still waiting for the trucks from Hattons, today or tomorrow with a bit of luck. Aaargh, I spoke too soon. The track at the baseboard join has shifted slightly and is causing derailments. The weather has been a little cooler over the last couple of days and I think the rail has shrunk a bit and pulled away from the join enough to cause a misalignment. I'll have to have another look and take more care. Visitors as maintainance of way crew, now there's an idea. The boys are 12 and 16, probably right up their alley. I'll give it a go. Photo's as soon as I can wrestle the digital camera from T.
The permanent way gang has been working overtime this weekend with a fair bit of progress but some disappointing hiccups as well. The young visitors didn't have much stamina I'm afraid. The 16 year old decided that the collection of spaghetti western DVD's he got for Christmas was a better option than being apprenticed to the GWR and retired to the television room immediately. The 12 year old contributed to some construction of the subroadbed but the pace was too slow for him and he contented himself with running the engineers loco up and down the 3 sections already laid. I'm really starting to get into the nuts bolts of track laying and electrics now but I am constantly amazed at how long it all takes to do it properly and at the learning curve too, it looks easy enough in the books but when you get down to actually doing the work it takes a couple of goes to get it right sometimes. I have, of course, not given myself an easy task with the gauge, size of layout and L-Girder frame I've chosen to use, so those of you who are starting off for the first time with a simple layout and flat baseboard need not worry, this is of my own making and there is plenty of help in this forum. The plywood subroadbed and cork roadbed has been extended another 4 metres or so and each section of track, about 5 and a set of points but more anon, is wired up with power feeders dropping through the subroadbed. The return wires have been connected up to the common return but I'm still working on the positive feeds, the wiring being a little more complicated as they have to take into account where the not yet existant control panels are going to be. The first set of points have been positioned and the Peco point motor power feeds soldered on and tested on the workbench and then attached under the subroadbed but not yet wired up. Before the next bit of rambling I need to let you know that on the last layout I used a holesaw to make bl*** big holes under the points to allow the point motors to be mounted directly to the sleepers. It looked awful. I know that you can cover the hole between the point and motors with paper or light card to help cover them up but I wanted to try the remote mounting block from PECO which is attached under the baseboard with an extension bar that is used through a much smaller hole to operate the points. To be on the safe side, I'm learning, I made up a small section of baseboard frame and subroadbed on the workbench and mounted an old set of points and motor to it to check for fit. I'm glad I did. a) The 35mm wide subroadbed width I'm using is too narrow to use all 3 screws in the PECO mounting block underneath the subroadbed and I had to be "creative" to get a firm mounting. Now all areas of subroadbed that will have points will be a minimum of 50mm wide. So, I got the new point in, connected to the point motor and joined it up to the flexitrack. Screwed it all down, soldered on the power feeds to the toe of the points and wired up the common return wire. Then, just for the fun of it I ran a couple of coaches up and down my new bit of track and tested that the points worked by manually changing them. About this time I noticed that the teeny, tiny little bit of spring steel wire that gives the moving rails their "flick" and holds them to the outside rails had stopped doing it's job, in fact it had popped out of it's little mounting holes and was sitting cheerfully on top of the sleepers. I reached over with a pair of tweezers to pick it up, got a good grip and then knocked my transformer/controller off the baseboard with my tummy. Needless to say that the teeny, tiny bit of black spring steel is now somewhere on the dark wood floor or between the cracks in the floorboards and to top it all off the transformer wouldn't work. About that time I went back to bed. 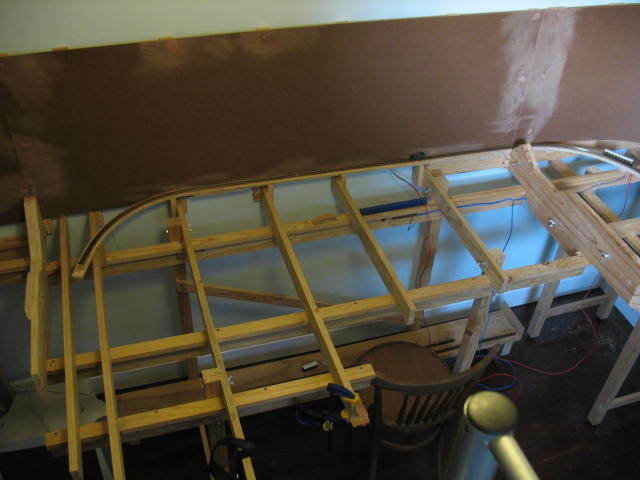 Here is a photo of that troublesome track at the baseboard join. 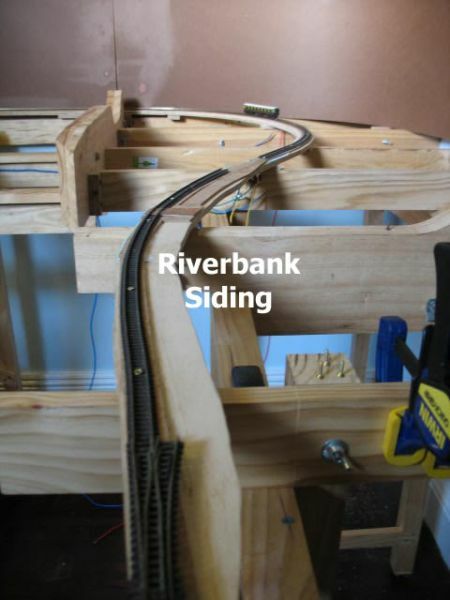 This photo of Riverbank Siding under construction shows the gap where the points were. Sigh. I'd be interested in hearing if anyone has found a way of using "springless" points. I have about 10 from the old layout that I daren't use as the springs are either rusty or rusted out completely but the remainder of the points are perfectly good, apart from needing a clean. Substantial bit of woodwork there, Marty. Most impressive. I wonder if it might be worth contacting Peco to ask their advice regarding re-springing points. Come to think of it though, they probably sell more new points if the old ones can't be repaired. I just had a second look at your trackwork photos The first one looks as though it may be under tension, preventing it from aligning correctly. If it is, a solution might be to cut out a section of track, say about a foot either side of the baseboard join to where there is a nice secure straight piece and then fit a completely new section in to replace the problem one. 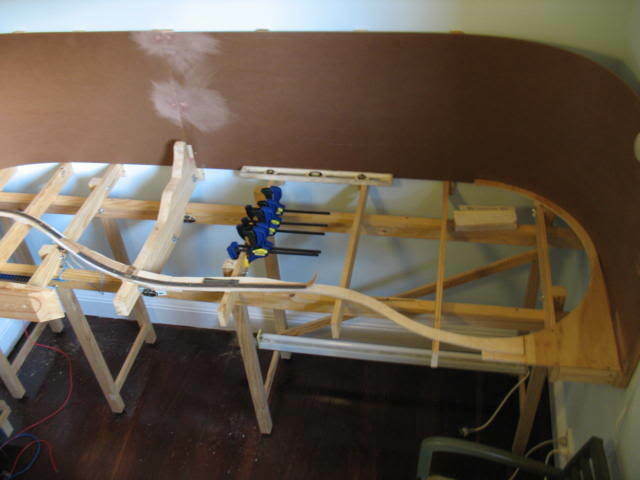 Initial alignment might be easier to arrange and you could make sure the track is well secured both sides of the baseboard join before cutting the new section apart. I dare say you have already considered this, but it's just an idea. Yeah, quite a chunk of wood work, I don't think T really knew what she was getting into when she unleashed me on the bedroom As you know it's taken me a while to get this far but.... I'm having lots of fun. I'll have a look at the tension, it's easy to fix, just unscrew and reposition. I think I can do it without cutting in a new section of track but if I can't it does seem the best method to resolve the problem. 4 photos - working around the layout room from right to left showing the state of play as of January 07. There is a fair bit of overlap between each photo. Riverbank Siding is under construction in the front of the baseboard, the main area behind the siding will have the Newcastle Emlyn Station, Yard and Engine Shed. 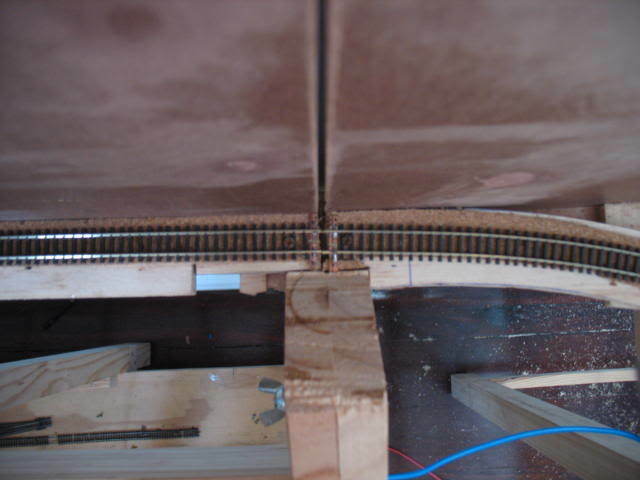 The Corner Baseboard, No 2, showing the curve from Riverbank Siding into the hidden loop running around the back of the board. There will eventually be 3 single track lines in the corner, two in tunnels under a hill that forms a view break between the Newcastle Emlyn Station on the right and Henllan Station on the left. 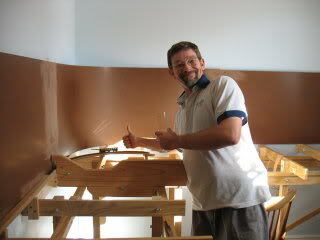 I'm really chuffed at how the masonite backboard curved so nicely, it was easy too. Just pushed into place and screwed. Baseboard 3 shows the return loop at the back. Middle right will be Henllan Station, front right the Green Grove Milk Factory and left is the biggest hill on the layout forming another veiw break between Henllan and the Pencader fiddle yard. The Pencader and all points East fiddle yard and the door to the layout room. I've got my controller/transformer back from the local manufacturer, all fixed and for nowt!! It's good to know that there is still quality service out there. I've replaced the broken point and picked up the next 2 that I need while in the hobby shop at lunchtime and it's a long weekend (Australia Day Holiday) down under this weekend too. Yippee. Not that I can hide away ALL weekend in the layout room, still got to balance life around the railway but with a bit of luck will have progressed a bit further by Monday. Sorry for the delay, took a while to knock it together. Happy to have comments/suggestions etc but as you know I'm a fair way down the track (pun intended) already and major rebuilds would need a really good reason. Thanks for the comments guys, I�ve included them because it�s nice to get the recognition for the work done and because further discussions refer to these replies. It's good to know that you got the controller back fixed and free of cost Marty. A good service is not the easiest thing to come by these days. Great looking track plan, very professional. I have a thing about fiddle yards Marty and am wondering how you intend to operate yours. They are usually so important in the smooth operation of a layout, especially in the smaller spaces. You have plenty of running room of course so perhaps it's not quite so important in your case. A very impressive track plan, Marty. There should be plenty of operating interest and huge scope for scenic work. I'm looking forward to continuing to watch it take shape. Like the track plan Marty, as well as the excellent graphics. What did you use? As far as changes are concerned, I have just one piece of advice -- DON'T. Plenty of potential for operating and scenic work and a reason for everything. Reckon you've cracked it mate!! Sorry lads, not ignoring you, just a bit weary at the moment. We had 3 days of 40 deg celcius temperatures over the weekend and a thunderstorm on the last day. The Thunderstorm created some wind shear over the local neighbourhood which has kept me busy with the local SES unit repairing the damage. Just haven't had the energy to write. Bob, you've got me with the fiddle yard. The only general thoughts I had was that it could be set up with a separate controller and an operator can work within the yard marshalling the trains as they come in. I've planned a run around track as you can see. The Newcastle Emlyn Branch doesn't see a lot of traffic. 5 or 6 return trips a day with a tank engine and auto coach or B-set of coaches, two goods turns, one about 10am and the other about 4pm and then the odd special cattle train or market day/football special, depending on the day. I haven't thought a lot about it and would be happy to have anyone�s input as I put the timetable together. Have you got a spot on the Barchester site about how you run your fiddle yard Bob? Perry, thanks, slowly but steadily we're moving along. 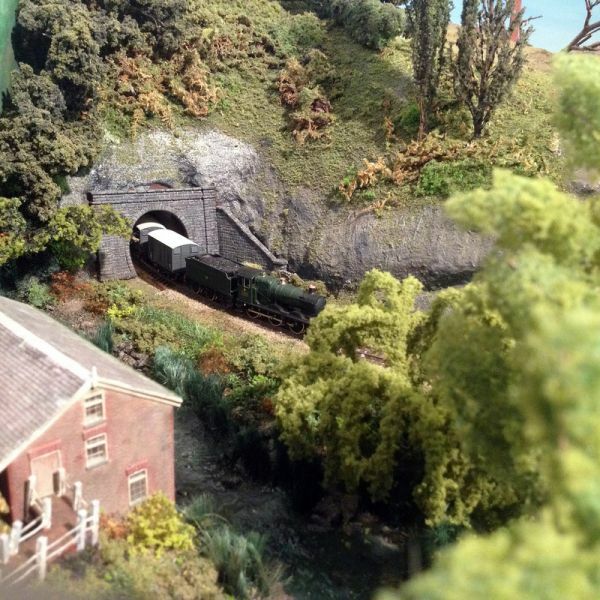 Despite the heat I managed to spend a fair amount of time in the layout room over the weekend. 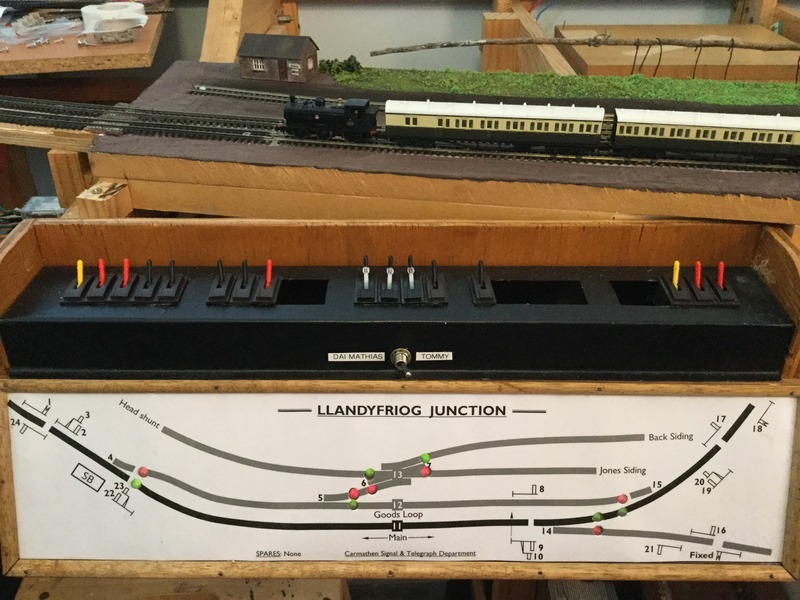 I've replaced the broken point, completed the Riverbank Sidings including making up a test control panel with point motor buttons and isolator switches, completed the Quarry siding and started to lay the return loop around the back of baseboard 1. Photos in the next day or so. I was well pleased with the progress and must have about 9 or 10 metres of running line now. My loco's have never had it so good. The 1 : 45 bank into the return loop has a bit of a kink in it, not easily noticeable until the little Dapol 14xx refused to climb it with 8 wagons attached. Closer inspection shows that I have miscalculated with one of my risers and I'm going to have to break the glue bond (no nails or screws used) and jack it up a little bit to get a smooth slope. I still don't think that the Dapol tank is going to be much good for more than 10 wagons. Some work needs to be done on adding a bit of weight to the plastic shell of the loco and making sure all of the wheels on my wagons run freely. I can assure you, many of them do not. Jeff, I exported the layout plan from the CAD package (Microstation) as a JPEG and then added the buildings and text in Adobe Photoshop freehand before resaving the JPEG. It's a bit fiddly but it works and if I had spent a lot more time I could have really gone to town with trees, fences, walls, etc. But time is of the essence and the posted plan was probably clearer without the clutter and said time is better utilised building the layout. So, progress is being made. I've a couple more power feeds to add to the newly laid track, the power is being carried by the rail joiners only at the moment, and then it's into the detail planning and construction of the Henllan Station and yard. Looking forward to that!